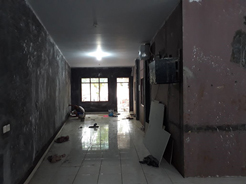 Following is a brief report on the status of an abandoned building extension project in Heesu. 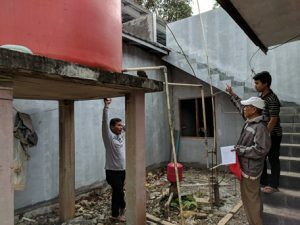 The donor PT Bina Cipta Indo Perkasa (independent of ANZA), stopped work at the end of Jan 2018 on the basis that its workers were needed urgently on another project and the sponsorship funds the company allocated had been fully utilised. Work was about 80% completed but without full completion the building cannot be utilised. Heesu has approached ANZA, PHMF and Thomas Huis for sponsorship assistance to complete the work. This new Girls Dormitory was planned to house 8 girls from ages 16 to 25 years. As they are now older it is appropriate for them to be provided a segregated dorm from the boys and a girls’ bathroom for privacy. Heesu will reuse the current bed frames but have requested sponsorship for 4 new mattresses. Status: All interior walls and pillars not painted. Basic lighting was installed. However, 2 air-conditioner units and 2 wall fans are still outstanding. The air-conditioner unit seen in the photo below is originally from the existing block. 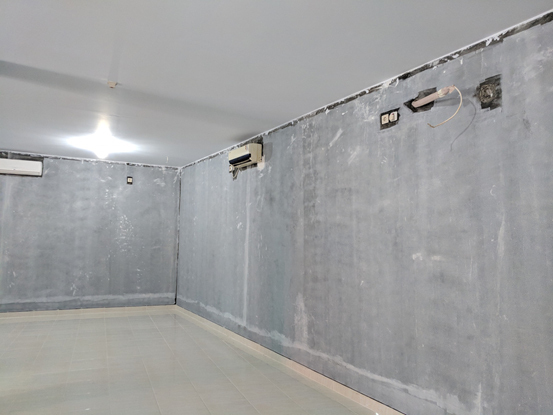 New girls bathroom – only wet works and tiling completed. But not fitted with any of the necessary fittings like WC, wash basin, showers and taps. A water heater and water pressure pump is needed for the showers to function. An exhaust ventilation fan is also required to help extract damp air and provide fresh air to the bathroom. 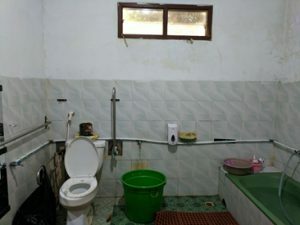 Following is the before and after photos of the recently renovated bathroom at Heesu sponsored by ANZA. The new girls bathroom is intended to follow this model. 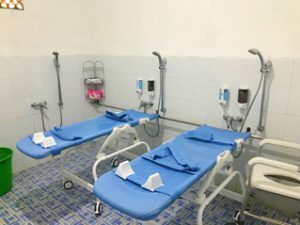 One of the bathchairs and one commode will be allocated for the girls. We recommend tidying up the current haphazard water piping system. It would be arranged neatly and to align with the water tank and stop valves provided for easy maintenance in the future. The ground pressure pump (small red tank seen in photo) will also be relocated to below the water storage tank. 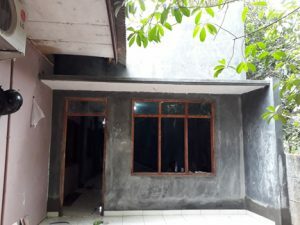 Heesu would like to create a small courtyard garden in this new space. Handrails for the staircase have not been provided. The roof overhang is too low and must be removed at sections to allow safe usage of the staircase. The staircase leads to an open air new laundry deck. This area is mostly completed with the exception of water proofing at the drainage points. 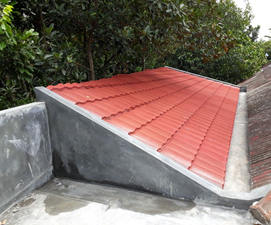 This necessary to help prevent water seepage to the dormitory below. 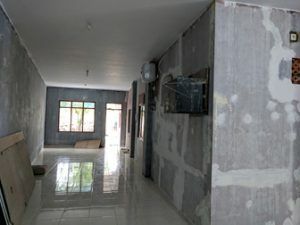 Two new staff rooms were also built. 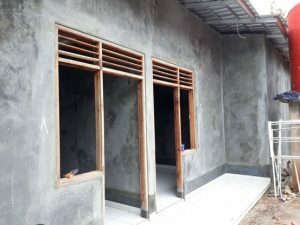 However, the walls have not been finished, windows and doors not installed. A basic light fitting has been installed but 1 wall fan is required for each room. 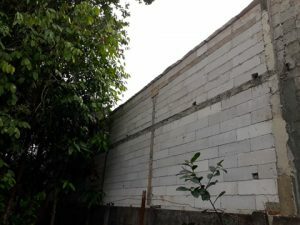 The wall for the extension building is also now the boundary wall for Heesu. Beyond this wall is the neighbor’s land. 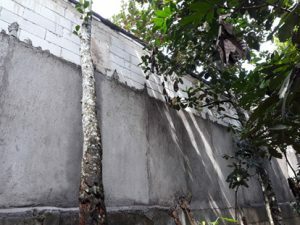 The wall needs to be plastered and painted with outdoor paint to ensure its integrity in the long term.